It’s almost always cold in Churchill, Manitoba, a remote coastal community on Hudson Bay in Canada’s subarctic region. Today, a month before winter officially begins, it’s -25 degrees C with a fierce wind coming off Hudson Bay which is thick with slabs of ice. Situated in the middle of Canada, it’s the world’s largest saltwater bay. 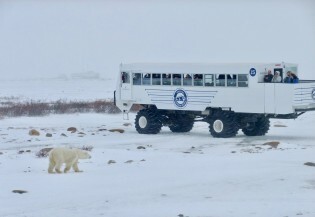 And even though frozen solid eight months of the year, the bay sustains the nearly 800 residents of Churchill which is known as the “Polar Bear Capital” of the world. In a clay pot, Araceli Márquez mixes tiny Mexican freshwater fish known as charales with herbs and a sauce made of chili peppers, green tomatoes and prickly pear cactus fruit, preparing a dish called mixmole. In the wake of the fire that destroyed more than 34,000 hectares of forests, some of them ancient, in Argentina’s southern Patagonia region, the authorities will have to put out flames that are no less serious: the new socio-environmental catastrophe that will emerge from the ashes. Roy Roger Gibson, an indigenous Kuku Yalanji elder, would watch thousands of tourists and vehicles trampling his pristine land while working on the sugarcane fields in Far North Queensland. His people were suffering and their culture was being eroded. The native wildlife was disappearing. He dreamt of turning this around. The 18 communities in Cuba’s Ciénaga de Zapata, the largest wetlands in the Caribbean, have long survived on the abundant local hunting and fishing and by producing charcoal. But that is no longer possible, due to climate change. Forty-five-year-old Serah Kei began building her artificial island and eco-lodge resort 26 years ago in Langa Langa Lagoon, located on the Solomon Island’s Malaita Province, about four hours by boat from the nation’s capital, Honiara. Kei, a single mother, paid for the construction by undertaking the laborious task of making and selling ‘shell money’ and finally opened Serah’s Lagoon Hideaway, which accommodates up to twelve visitors, in 2006. Tourism, widely regarded as the mainstay of Caribbean economies, is being challenged to remain sustainable in an era of climate change and its impact on beaches, rivers and other attractions. The residents of San Crisanto, a small communal village nestled in an idyllic setting in the southeastern Mexican state of Yucatán, have learned that valuing and protecting natural resources can generate employment and income. The Tsimane Mosetene people in Bolivia’s Amazon jungle region have found a tool to preserve their habitat and way of life: a community ecotourism project that won a United Nations-sponsored international award. Religion & Development: An Enhanced Approach or a Transaction?